Destination Unknown – Children on the Move is a thematic campaign focused on the phenomenon of child mobility. The campaign recognises that children too, have a right to move away from exploitation, disaster and other situations that they may find difficult. It will promote “the best interest of the child” whenever and wherever the child is. 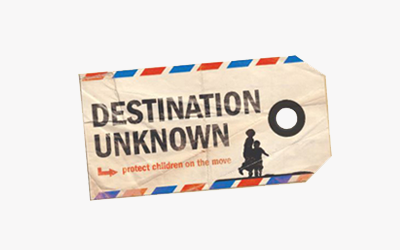 The Children on the move- Destination Unknown is a campaign launched by the International federation of Tdh based in Geneva. In India the campaign is being actively supported by TDH Lausanne Foundation, TDH Netherlands, TDH Suisse Geneva and tdh Germany. This year the campaign will be led by Terre des hommes Germany India programme. In the first year the campaign will focus its work in Andhra Pradesh and in West Bengal.